The WeAreDevelopers Conference takes place in Vienna once per year and provides thousands of developers with the latest insights. 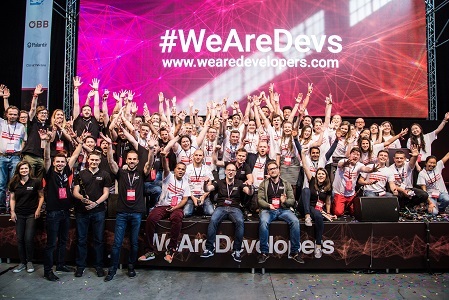 This year, reaching the 4th edition, the WeAreDevelopers takes place on May, 16-18 and brings together more than 8000 attendees and a top-tier line-up of speakers. Global Women in Tech just interviewed the team to find out more about the agenda, speakers and „not-to-be-missed” features of the event. #1. WeAreDevelopers event reaches the 4th edition this year. Which are the main "not-to-be-missed" features from the agenda? The WeAreDevelopers World Congress 2018 is expecting more than 8.000 attendees, which will let themselves be inspired by Keynotes, Talks, Panel Discussions and Workshops from more than 200 of the brightest minds in the IT industry. Deemed by many as the "Woodstock of Developers", everyone can find their flavour - with topics varying from Backend to Frontend, AI, DevOps and Testing, OpenSource or Mobile Development. The highlight of the Congress will be the Keynote by the father of the modern computer, Steve Wozniak (co-founder of Apple Inc.). The speaker lineup includes Andreas Antonopoulos (Open Blockchain Expert), Angie Jones (Senior Automation Engineer at Twitter), Joel Spolsky (CEO of Stack Overflow), Joseph Sirosh (VP of Artificial Intelligence at Microsoft), Maria Naggaga (Senior Program Manager at Microsoft), Zeev Suraski (Co-Founder & CTO at Zend Technologies), Brenda Romero (Game Designer) and many more. You can find a full list of our speakers here. #2. The event gathers thousands of participants from all over the world. For a first time participant - what tips do you have to make the most out of the event? The Congress will be similar to a large developer playground. It's taking place at the Austria Center Vienna on 4 floors, 6 stages, more than 25 Workshops and over 10 tracks throughout the 3 days. It can get overwhelming, which is why we are trying to emphasize to our attendees that looking through the Agenda on either the Website or Mobile App, and creating a schedule beforehand could improve the overall experience. #3. At Global Women in Tech, we aim to support and encourage women leaders in the field, starting with building and promoring an international community of ladies in the field. Events like yours make a tremendous contribution to advancing this topic. Can you share more about your Women in Tech section? At WeAreDevelopers, diversity is a very important topic, which we take very seriously. For this reason, we have selected some of the brightest female tech leaders that inspire us every day to speak at the Congress. Moreover, we are proud to announce that this year’s conference bags are being manufactured by Teenah, a new startup company supported by UNICEF. Founded in 2017 by co-founders Raneem Meqbel and Agnes Aistleitner, this social bag manufacturer provides sustainable work opportunities for refugees and underprivileged women right where they are needed — in the small Jordanian town of Idrib, just 25 km from the Syrian border. You can find out more about our efforts to contribute to diversity in tech here. #4. From our own experience, most times the participants and speakers share very candid feedback regarding their experience at an event. Can you share with us some inside stories / feedback? We take feedback to the heart and always try to learn from past mistakes, in order to improve the attendees' experience. This year, we introduced more breaks to the Agenda, so that our attendees have enough time to enjoy a cup of coffee at one of the 12 mobile coffee stations that are spread across the 4 floors of the venue. Moreover, we've selected talks that deliver more in-depth content, not just scratching the surface. Besides the 3 days of the Congress, the Facebook Developer Circle Vienna will be hosting their monthly meetup on the 16th of May from 4 pm until approximately 6:30 pm. Moreover, the Congress Afterparty will take place on the 17th of May in the Praterdome, one of the most well-known clubs in Vienna. The entrance to the club will be permitted exclusively to attendees, speakers and partners of the WeAreDevelopers World Congress 2018, and their plus ones.